Galaxy Cluster IDCS J1426.5+3508 (IDCS 1426 for short) is yet another group of extragalactic objects that challenges mainstream astronomers. Because of their interpretation of observations made with NASA’s “Great Observatories”, under the assumption that gravity is the dominant force in the Universe, they have to once again imbue the objects with exotic properties that do not even readily fit into their own models of the Universe. They do not begin to consider the tremendous role that the electromagnetic force plays in the Universe, even though it is 1039 (or one duodecillion) times stronger than the force of gravity, the weakest force in the Universe. They do not consider the conditions of a Universe that is 99.999% hot ionized particles, or plasma, and a powerful conveyor of the electromagnetic force. For example, because of their interpretation that the observed redshift of the galaxy cluster is the result of the expansion of the Universe they place the cluster at a distance of 10 billion light years away. According to their cosmological model that means this enormous galactic cluster was already formed when the Universe was only 3.8 billion years old, or only a quarter of its current age. This makes it one of the most distant and earliest galaxy clusters ever detected. This is a really diplomatic way of saying that their interpretation of redshift pushes the cluster’s time of formation beyond their accepted cosmological model for such formation. In other words, they have no real explanation for how an entire galactic cluster could possibly be formed so early in their accepted age of the Universe. If they accepted that galactic redshifts can be generated by plasma, the distance of the cluster, and indeed the entire Big Bang model of the Universe itself, becomes irrelevant. Another example of these astronomers trying to use gravity to explain their observations of IDCS 1426 is their claim that 90% of this entire galaxy cluster is made of dark matter. Dark matter is a hypothetical substance of which not a single particle has ever been detected despite over 80 years spent searching for it. Instead of accepting that it is the X-ray emitting plasma actually holding the cluster together through the electromagnetic force, the astronomers are instead forced to once again invoke a hypothetical substance as some sort of invisible gravitational binding agent. 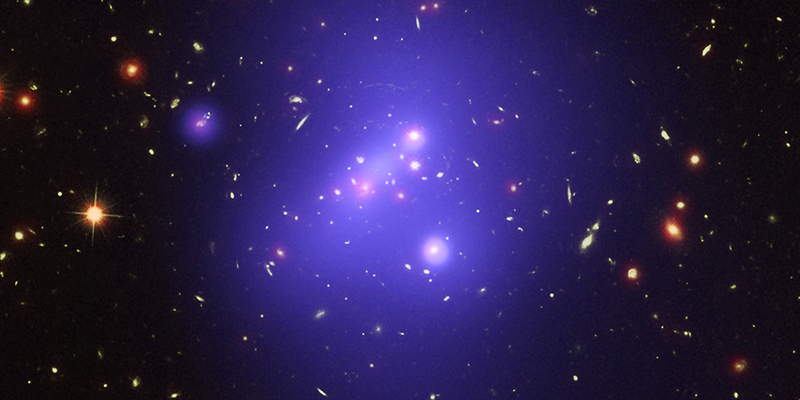 Invoking dark matter also forces astronomers to calculate a fantastical mass for the galaxy cluster in the range of 500 trillion suns or around 1,000 Milky Way galaxies. They claim that this mass calculation is not only based on the theorized amount of dark matter present in the cluster but also the gravitational lensing caused by this undetectable substance. They do not consider that lensing effects can also be caused by plasma and that this is primarily what is causing the lensing in this cluster. Instead, these astronomers, along with most of mainstream astronomy, would rather stick to their current models, resisting any opportunity to question them or to consider other models. Unfortunately, in order to not upset their current understanding of cosmology and the Universe, mainstream astronomers continue to ignore the electromagnetic force and continue to try to refine their models. 2 comments on "Is Galaxy Cluster IDCS J1426 one of the most distant ..."
kudos for putting the problem into simple exquisite, easily understandable terms. Keep up the good work.Although I am a Science Fiction writer (pen name PanOrpheus) I like to know what cutting edge alternative views of Science are saying about the current crisis in Cosmology and many related sciences. Thanks Howard. I also really strive to include in each of my posts real examples of and real evidence for an alternative view of the Universe.